Amanda and Jim McKinley embody everything that defines a power couple. They are parents, creatives with professional interests and educators. Amanda is a content writer and homeschooling mom, while her husband and workout partner Jim works as a digital marketer and adjunct professor at Baylor University. They support each other for their goals in the gym and life, and they bring an incredible spirit with them to the gym. You’ll often see them before or after a workout doing extra work! Why did you and your training partner decide to train together? 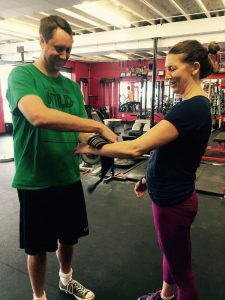 Amanda: I originally gave my husband a ‘training session’ at ASF after hearing him express frustration about his knees bothering him a lot and being unable to do a lot of the things he used to do. I figured some strength training might help and the gym/personal trainer he was going to at the time just didn’t seem to be helping. Jim: It really just sort of evolved. Amanda and I are married and originally started working out with two separate trainers. However, there were a few occasions where we had the opportunity to work out together. We had so much fun that we decided to train together on an ongoing basis. What do you like most about training with your partner? Amanda: I am a quality time person, so I just love being with him. It’s fun to encourage one another and tease each other during work outs. We often grab lunch afterwards so it’s like a little date in the middle of the workday! Jim: Definitely the camaraderie. We enjoy laughing together, teasing one another and, ultimately being able to encourage each other during our workouts. For example, my wife always likes to remind me that she has, according to her, a “much stronger core” than me. The last time we did planks, I let her talk smack for a little while before I walked over and dropped a 20-lb sand bag at her feet. Just to spite me, she went on to do her planks with the sandbag. What inspires you to continue to workout with your partner? Amanda: Fun + Health. We are enjoying time with one another AND getting a great workout. What more could you ask for? Jim: The shared experience of something that we can do together that is both fun and improves the quality of our lives. What have you seen change in your partner since you started training together? Amanda: It has been REALLY cool to see how much my hubby has changed. His clothes fit differently, his upper body is stronger and he’s lost weight. He looks really good. It’s fun to hear people ask him what he’s been doing to get in such great shape! Jim: I have seen two primary changes in Amanda since we started training together. The first, and obvious one, is that she has become stronger and more fit. The less obvious one is a greater confidence in weight training. For example, on one our “off days” or when we are traveling, she is much more likely to pick up weights at the gym and add them to her workout. Before training together she would not have the confidence to do something like that. How has working out together changed your relationship? Amanda: It’s fun to push each other a little. He really challenges me to work on improving my upper body strength while I like to tease him about his core weakness. We have been known to have a medicine ball tossing contest in the middle of the gym. A little healthy competition is always fun! Jim: It has given us another thing to share and do together. When we first started dating (a LONG time ago) both of us ran marathons. That provided a natural outlet to spend time together and do something athletic together. However, as I have gotten older and have left my marathon days behind me, we were lacking a mutual physical or sports outlet. Training together has brought that back. What is your favorite thing to do together outside of the gym? Amanda: Work in the yard together, go on hikes, travel to fun places, do something adventurous, spend time out in the country, enjoy a nice dinner, get Chinese foot massages and spend time with our kids. Why did you decide to train at ASF? Amanda: I had noticed ASF every time I stopped by Torchy’s Tacos and really liked the look and feel of the gym from the outside. There were all types of people coming in and out the doors – everything from the intense weight training type to the older, getting healthy type. I liked that it was a diverse range of clientele. Then I got online and started reading reviews and was like, okay, we gotta try this. We’ve been huge fans ever since!! !